For our customers especially those other than those in the deep South states, we will pack using live Spanish Moss for 1 cent extra. Sorry, this software will not let me give it away for free, but if that is an issue, we will credit back the 1 cent. It actually makes a eco friendly packing material. This is grown in our greenhouses, and should be virtually bug free as opposed to plants collected in the wild. 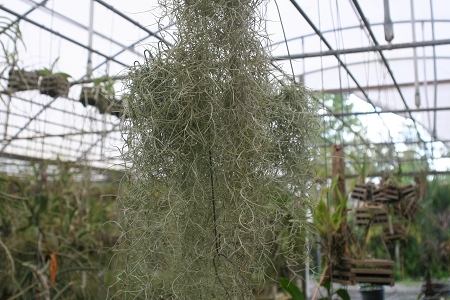 Great for adding humidity to heated homes and greenhouses Spanish Moss is actually a bromeliad air plant (Tillandsia usenoides) and drapes many trees in the Deep South. It does not harm the tree and actually acts as a filter and oxygen producer and building material for many bird's nests. If you like, you can hang this on any shade tree or it will even grow just hung on awire hanger in partial shade Spray occasionally with water if you live in a low humidity area, but it usually dervies enough moisture just from morning dews and natural rainfall. Great for producing extra humidity in greenhouses. This is grown in our greenhouses and is pest free, not wild collected. If you would like it included in other catagories, we will try to fit a portion in the shipping box at no charge.